The dovecot at High House, Purfleet is one of the best in Essex, according to Donald Smith who wrote the definitive work in Essex dove houses in 1931. The last sixty years have not dealt kindly with the fifty-nine dove houses which he listed. Of the four he refers to in Thurrock, that at Hunts Farm, West Thurrock has long disappeared and there remains only a vestige of brickwork of the one at West Tilbury. Fortunately the other two, at Arden Hall, Horndon-on-the-Hill (repaired in 1991) and the one which is the subject of this note, are both in good condition, and I suspect that a 50% survival rate is better than the average for the country as a whole. High House dovecot is owned and well maintained by Blue Circle Industries Plc and is under the friendly eye of Mr and Mrs Vellacott who live nearby. In 1990 the Society entered into an agreement with BCI which permitted the Society to show the dovecot to visitors and it is for this reason that the following notes on its construction and relevant history are given here. The building is octagonal with an external side of 2.95 metres and built of brick with an irregular bond. There is a rendered plinth and a prominent cornice originally apparently of lath and plaster, now in cement rendering. The roof is tiled with modern bonnet tiles on the ridges and rises to a square glover with a pyramidal roof and a weather vane. There is a north-facing dormer window. The door, or rather doors are most unusual. 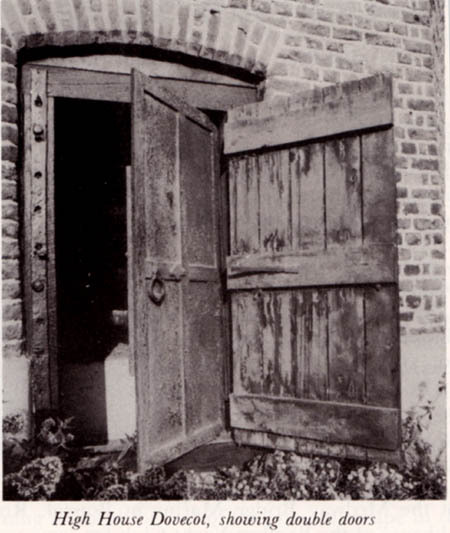 On opening the external wooden door a second iron door with a very substantial lock is revealed. The reason for this high security is uncertain but one possibility is the high price (up to two shillings each) offered in London during the nineteenth century for live pigeons for target practice, this being before clay pigeons were made. Inside a visitor immediately notices the central potence or mobile ladder which is still in working order and which gives access to the 517 L shaped nest boxes or pigeon holes, formed within the brickwork of the walls. 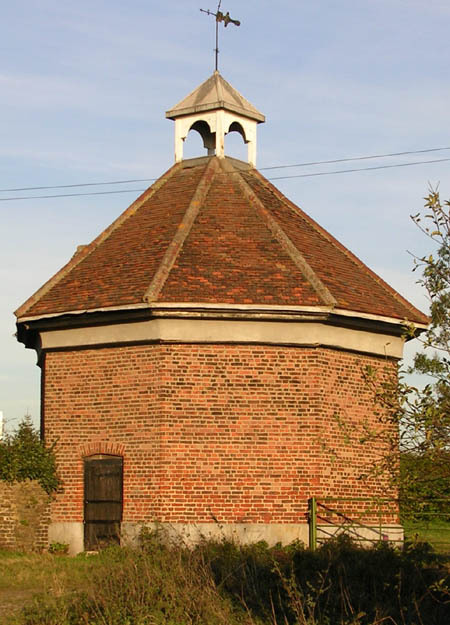 Octagonal brick dovecots tend to be of 18th century date but the List of Buildings of Special Architectural or Historical Interest (it is a Grade II building) suggests late 17th century. The history of the manor throws some light on the date of the building. The manor of Stonehouse, West Thurrock, the manor house being on the south side of the London road at Stonehouse corner, was bought in 1548 by Robert Long (d. 1552) a mercer of London and his wife Cecily (d. 1559). They had two daughters, Martha and Magdalen and when Robert died Cecily, in order to divide the manor fairly between the two girls, decided that a second manor house was needed so The Place or New Place, later to be called High House, was built some 450 metres west of Stonehouse. The two manors passed through several separate hands until Sir Robert Clayton bought both in 1677 and rebuilt High House in brick and this is the building that stands today. A breach occurred in the river wall a few years later, flooding the marsh lands; although Sir Robert Clayton made strenuous efforts to repair the wall, his neighbouring landowners appear to have done little or nothing. The government, being convinced that navigation of the Thames was likely to be impeded if the breach was allowed to continue, employed a Dutchman, Cornelius Vandenanker, to repair the breach. It was standard practice in these circumstances for the Government to confiscate the recovered land and it seems that Vandenanker acquired the land in payment for his services. Vandenanker died soon after and it was left to his widow, Sarah, to buy High House itself from the now bankrupt Clayton in 1684. Sarah married Benjamin Desborough in the following year, and he in turn had to sell up to Caleb Grantham in 1697 due to a further breach in the river wall. Returning to the dating of the dovecot it seems likely that its construction took place in a period of comparative affluence of the manor soon after 1677 or possibly between 1684 and 1697. Source: Use has been made of the Victoria County History of Essex as a source for much of the historical information in this note. In 2010, the gates opened on the brand new, state-of-the-art, Royal Opera House Production Park on a 14-acre site at High House Farm, Purfleet. This will be the UKs first ever national centre of excellence for technical skills, crafts and production for the performing arts and live music. It will house a world-class production facility for the Royal Opera House and the new National Skills Academy for Creative & Cultural Skills, as well as workspaces for creative enterprises. Community, education, exhibition and meeting spaces will be located in the restored, Grade II listed High House Farm buildings that are at the heart of the development. This unique combination will make the Production Park a magnet for related companies, organisations and talented individuals. The Royal Opera House Production Park will act as a focus and catalyst for the skills that it hosts by providing training, education, business and community spaces for the local area. The neglected, Grade II listed farm buildings of High House will be restored to their former glory and returned to daily use. Features including a one acre walled garden and play space which will provide a fantastic environment for workers, visitors and local people to enjoy. The Royal Opera House Production Park is a unique partnership between the Thurrock Thames Gateway Development Corporation, Arts Council England, Creative & Cultural Skills, the East of England Development Agency, Royal Opera House and Thurrock Council. In September 2010 it was announced that the Thurrock Thames Gateway Development Corporation would be wound up and its powers transferred to Thurrock Council in 2012.